Walk-in tubs are exactly what they sound like—tubs you can walk into. They have doors that should be watertight and a much lower step-up level than traditional tubs do. Anyone can use walk-in tubs, but they’re usually targeted toward senior citizens, people who are obese and folks who have mobility issues. 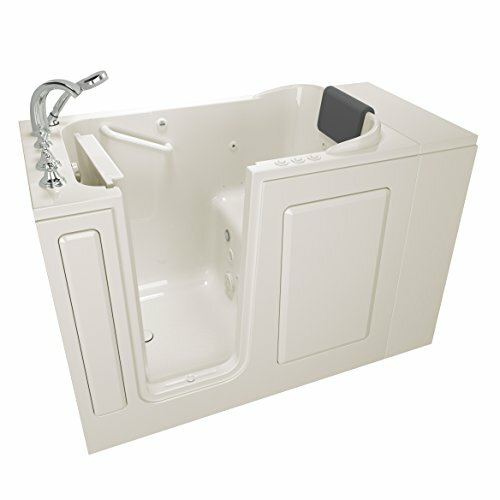 In fact, some types of walk-in tubs are designed to provide people in wheelchairs with a great deal of independence as they bathe. They may be able to get into the tub right from their wheelchairs. American Standard is a well-known company in this field and has carved out a reputation for combining luxury, massage therapy, top-notch safety and accessibility with its range of walk-in tubs. The company offers tubs that are available in different door and installation configurations, and the tubs have varying options for features such as air baths and whirlpools. American Standard walk-in tubs deserve a rating of 4.3 stars out of 5. In addition, when you buy from Amazon and are a Prime member, shipping should be free. 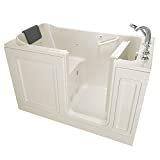 You can call 1-866-423-0800 before you make your purchase to speak with a walk-in tubs specialist for detailed information and to ensure you choose the right tub for your needs. If you need a tub that is wheelchair accessible, some have a step-in lower than 3 inches. Similarly, if you are overweight, you may prefer a bariatric tub, which comes with a wider door and larger seat. Why Should Seniors Use a Walk-in Tub? About one in four seniors per year experiences a fall at home, with many of those falls occurring around a bathtub or shower. These falls send quite a few seniors to the emergency room and can seriously compromise their quality of life. 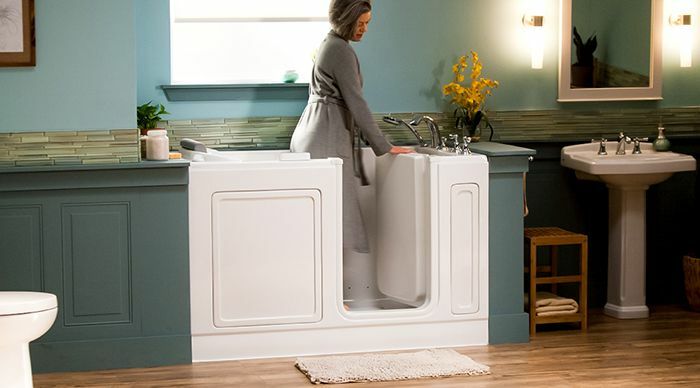 With walk-in tubs, seniors may be able to prevent falls and live at home longer. They and their family members can enjoy the peace of mind that comes with this security. 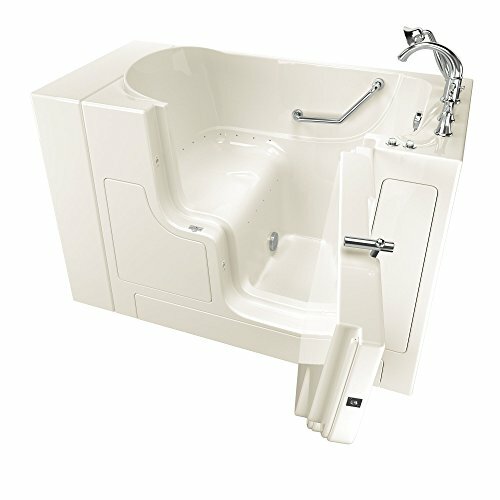 This tub is the most luxurious of the tubs touched on here, as you may have guessed from the number of jets and the price. It also uses less water and can fit into snugger spaces. Reviews: There are no reviews on Amazon yet, but American Standard walk-in tubs generally get extremely favorable ratings. If you have the budget for an extremely high-end tub, this could be it. 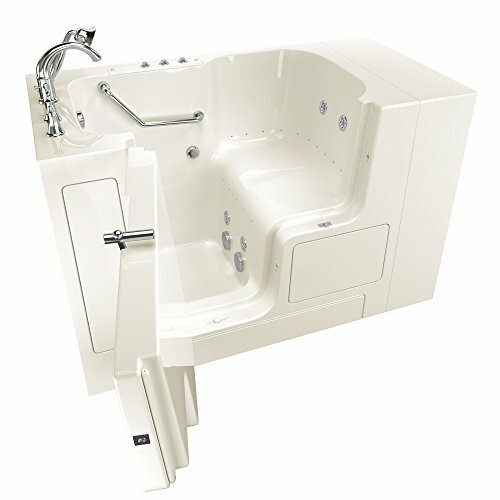 This tub costs about twice as much as many other American Standard tubs, but you’ll certainly be in for a terrific massage experiences. 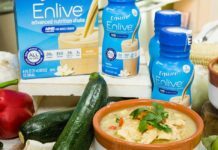 In fact, if you have severe issues with arthritis and pain, this tub may even be a must-buy because the other tubs may not have quite enough “oomph” to soothe your body to the extent that this tub can. This tub is just a bit larger than the one above, so you get a little more space while still enjoying a snug fit and the use of less water. You also pay about half the price. This tub comes at a good price, delivers great massages and a relaxing experience, and fits well into small spaces. However, these features may mean problems with finding it in stock. This is another well-priced tub that is smaller than the two above. If you’re looking for a more-affordable version of this tub, try the 2848.109.CLW Gelcoat Premium Series model. It sells for about $3,526 on Amazon and comes with 26 air jets along with 13 water jets. However, this model is a bit heavier at 205 pounds versus 189 pounds for the higher-priced model. This tub can hold the most water of the tubs detailed in this review, and it is relatively large. This tub comes at a good price and can accommodate you if you are larger. It’s bigger than the other American Standard walk-in tubs, so it is best for more generous spaces. It weighs a relatively hefty 324 pounds, and like many of the other tubs touched on here, it may be out of stock temporarily on Amazon. This tub is comparatively affordable and designed for smaller spaces. It has many of the same high-quality features that the other tubs do. This tub weighs a relatively light 151 pounds and fits well in small spaces. Its features and affordability can be double-edged sword, as models may not be in stock. On the ConsumerAffairs website, American Standard walk-in tubs have an average rating of four stars out of five. That rating is based on 233 reviews in the past year, so it’s a good-sized base. There are 135 five-star reviews and only 29 one-star reviews. The public perception of these walk-tubs is overwhelmingly upbeat. Many reviews mention the positive experience with the sales reps and that the reps can assess a bathroom space and give a good idea of what type of tub might fit and any modifications that may need to be done. The installers generally do a good and accurate job, usually completing installations in a day or less. The quality of the product is high, and all of the components generally work as they should. The reviews on other sites such as TrustPilot and ConsumersAdvocate are also overwhelmingly positive, with overall ratings totaling between four and five stars. 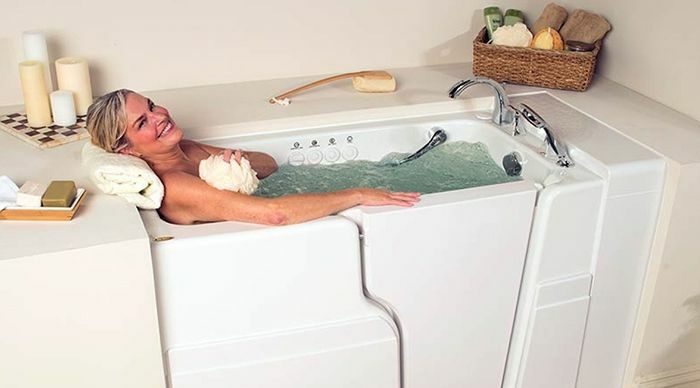 Ariel Bathtubs is another company that makes and sells walk-in bathtubs with safety features geared toward senior citizens. Ariel’s tubs tend to cost less. However, it’s not something that would be called wheelchair-accessible, exactly. For example, the seat and door are awkwardly positioned if someone wants to move from a wheelchair into the tub. That said, it should be fine for people with restricted mobility. There also aren’t water jets and air jets with this model, although they can be added on from the manufacturer for a significant price increase. Basically, most of Ariel Bathtub’s walk-in tubs are for budget shoppers and do not necessarily give consumers the luxury or pain relief they may expect with American Standard. Like with American Standard, customers generally review Ariel’s walk-in tubs positively. They are grateful to be able to buy walk-in tubs for a lower price even if they are soaker tubs and do not necessarily come with jets. You may decide to do a bathroom remodel at the same time you get your walk-in tub installed. There are many dual-flush toilets that are financially economical and that also save on water. Bathroom grab bars provide extra security and lots of convenience. You can pick several up for a great price to help with your balance throughout the bathroom while you stand and move around. Bathtub mats can give even more “grip” in your walk-in tub. The tub should ideally be well textured, but if you need an extra layer of protection, a mat can offer that. They come in many colors and sizes. Many are machine washable and antibacterial, and they can act as a temperature buffer in case the bottom of your tub happens to be warmer or colder than you expected. Many walk-in tubs come with handheld shower heads, but if you would prefer heads with different pressure levels or spray settings, there are plenty to choose from. American Standard walk-in tubs provide a high level of luxury, but there’s always room for more relaxation via something such as a bath pillow. With a pillow or two, your body can get in better ergonomic position for longer soaks with less pain and give you some grip on the outside of the tub. Look for pillows that are nonslip, thick, soft and large. 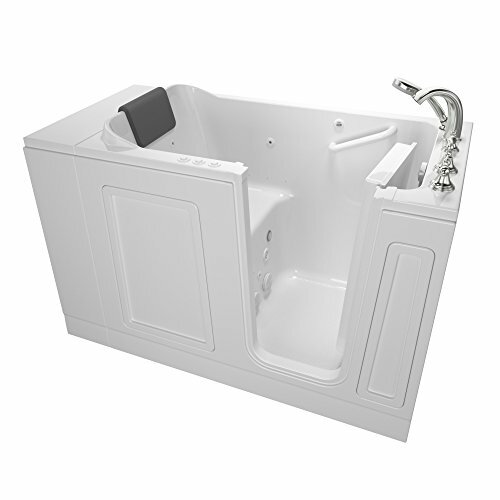 American Standard walk-in tubs are a great option for consumers who have a little extra money to spend on luxury because of features such as air and water jets. In fact, such “luxuries” may actually be necessities. The reality is that many people who use walk-in tubs also have issues with arthritis or chronic pain. 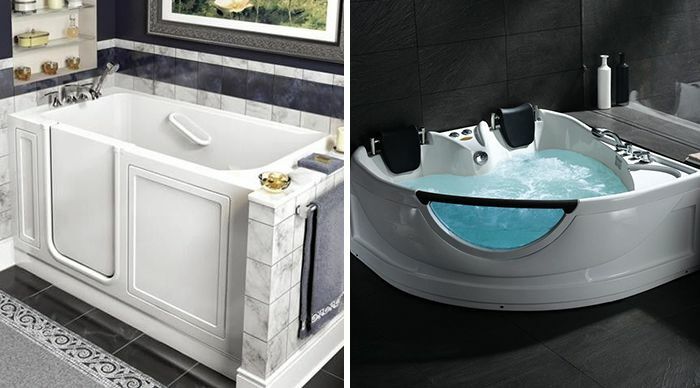 By investing in an American Standard tub compared with something such as an Ariel tub that doesn’t come with jets, you may save money in the long term with fewer doctor appointments and an enhanced quality of life. That said, if you are extremely budget-conscious and pain isn’t really an issue, you might prefer something like an Ariel tub. These tubs get great ratings as well, and you can explore the possibility of adding on jets if that’s what you want. 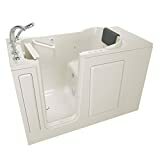 After reading this review, you may have questions about American Standard walk-in tubs, or perhaps you would like to add to what’s touched on here. If you have experience with walk-in tubs and tips for their purchase, use or installation, feel free to comment below. Leave your questions below, too! Yes, American Standard Walk-in Tubs have a pretty high asking price, but the convenience they provide should be worth every penny spent on it. Not only will getting into a tub become a trivial task for mobility-limited individuals, potential falls and accidents in the bathroom should also become a thing in the past. Next articlePhilips Lifeline Medical Alert System Review: Is It For You?